Brad Pilon is a nutrition professional with over 12 years of experience in the nutritional supplement industry. 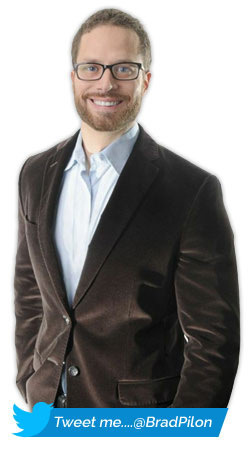 Brad specializes in a common sense approach to weight loss and nutrition. He lives in the greater Toronto area and is the author of several books, including ‘Eat Stop Eat‘, ‘Good Belly, Bad Belly‘, ‘How Much Protein‘, ‘Thin Air‘. Brad has been obsessed with exercise, health and nutrition since his youth. Before he left grade school, he had already read countless fitness magazines, and by the age of 17, he was working in a supplement store. Naturally, Brad decided to study nutrition during his college years. Soon after his graduation in 2000, he found himself working in the world’s leading supplement companies as a research analyst. This career gave him the opportunity to travel the world. From China to Germany, in Scotland and England, and all over North America, he has had the privilege of meeting some of the world’s greatest minds in sports nutrition and exercise sciences. While Brad was working in the supplement industry, he began to discover that the weight loss industry was full of misinformation. Most research on weight loss seems to be attempting to uncover what Brad calls a “backwards idea” – What should we eat to lose weight? Nearly a decade after beginning his career, Brad left it all behind and set out to find the true scientific facts behind weight loss and nutrition. Brad proved that a routine known as intermittent fasting is the key to successful weight loss. He recommends that individuals fast two days per week, and, throughout the rest of the week, eat sensible meals and maintain an exercise routine. Cutting calories, Brad says, is the only way to effectively shed pounds. The Eat Stop Eat method is “the simplest way to eat and to live that will help you lose weight and keep it off,” he says. Brad admits his ideas may be controversial, but he believes that readers who approach his book with an open mind will find that his theories make sense. From 2000 t0 2006 Brad was a manager at ‘Iovate Health Sciences‘ where he helped lead the Research and Development team for one of the world’s largest and respected supplement companies. While working at Iovate he gained experience in product design, research design and patent drafting. Next five years Brad had been working at ‘Life Science Nutritionals‘ as a vide-president of Product Development. He assisted create and market adult and children’s gummy vitamins for an innovative start up company that has gone on to see tremendous success in the gummy vitamin marketplace. In 2011, Brad had become an full-time athour in weight loss, nutrition and fitness fields. Brad Pilon holds two science degrees from the University of Guelph – a Msc in Human Nutrition and Nutraceutical Sciences and a BaSc in Applied Human Nutrition. Red Wine extracts containing Proanthocyanidins acting as aromatase inhibitors for the purpose of maintaining testosterone levels for the purpose of influencing muscle mass. Disclosed herein is a process producing a therapeutic comestible gummie product, the process comprises providing a sugar and/or sugar alcohol, water and heating to at least 80° C. to produce a first mixture. A gelling agent and water is also provided and heat to at least 80° C. to produce a second mixture. Combining the first and second mixtures to produce a slurry. The slurry is heated to at least 112° C. to produce a gummie base. You can learn more about patents created by Brad Pilon on Google Patents.